The film events take place in Moscow in the 1970-s. The plot is based on the classical love triangle: two youths and a girl. They are students of the same institute of higher education, live in a large country without suspecting that soon it will vanish from all the maps of our planet. This film narrates about love, youth, and the country named the Soviet Union. The pre-production period included building of complicated settings, bringing of the location objects into line with the required epoch and screen tests, quite possible longest in Shakhnazarov’s practical work by his own admission. The students of Moscow and Saint-Petersburg theatrical schools Alexander Lyapin, Lidia Milyuzina, Egor Baranovsky and Ivan Kupreenko were appointed for leading parts after almost three months of daily showings, readings and film tests. All they are debutants in cinema, and the young people coped very well with their tasks in undivided opinion of all members of the production unit. 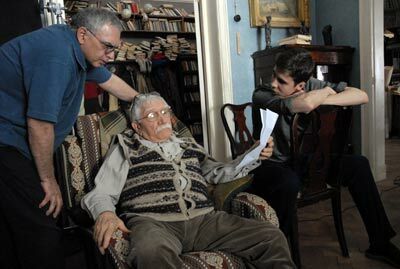 The well-known actors Armen Dzhigarkhanyan, Olga Tumaikina, Vladimir Ilyin acted supporting roles in the film. The film shootings were carried out in Moscow, Gagry, Khiva, on the ruins of ancient Khoresm and lasted for three months. The director of photography Shandor Berkeshi (Koktebel, Free Quest, Arbat Children) was charged with the picture corresponded to the required epoch; the legendary Mosfilm art designer Lyudmila Kusakova was charged with sceneries (The Pokrovskiye Gates, Assasin, The Star). The premiere of the new film by Karen Shakhnazarov in cinema theatres of the country is to be performed in the beginning of the next year.